Mars could well be called "the Pigpen Planet" because it's the dustiest place in the solar system. For at least a billion years, Mars has lacked oceans or other large bodies of water to trap windblown material and sediments. As a result, the entire surface of Mars is dusty, with few places swept completely bare for long. The dust in fact gives Mars its warm color, making it the Red Planet. Mars dust forms by the weathering of rocks over long periods of time. This happens as winds, including dust devils, blow around sand and loose particles. Due to Mars' lower gravity (about 38 percent of Earth's) and less-dense atmosphere (less than 1 percent of Earth's), particles can hop higher than on Earth and fly farther on each hop. The impact of these windblown particles chips off tiny pieces of rock, which the wind picks up and throws against other rocks in a process that never quits. Each collision helps grind particles down into smaller pieces until they are five to ten times finer than baby powder. The particles average 3 micrometers (one ten-thousandth inch) in diameter, with some as big as 20 micrometers (eight ten-thousandths of an inch). As dust particles fly, bounce, tumble, and hop across the surface of Mars, the iron minerals in them become chemically weathered by traces of water vapor in the air and moisture at ground level. Just like what happens on Earth, the iron minerals oxidize — they rust — producing Mars' familiar color. But dust on Mars doesn't always remain on the ground. When winds blow faster than about 20 meters/second (45 miles/hour), they can pick up dust from the surface and carry it to great heights in the atmosphere. When this happens, the stage is set for a dust storm. 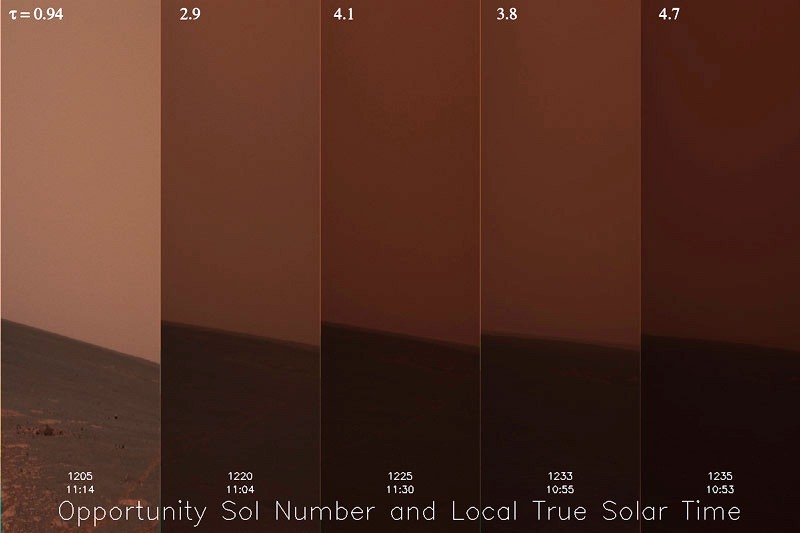 Martian dust storms occur at local, regional, and global scales. A "local" storm on Mars would be as big as Arizona, and a "regional" storm could cover the United States. Some storms begin as local but spread in a few weeks to engulf the globe. Others never grow beyond local or regional size. Scientists don't know why some storms grow big, while others don't. Scientists also don't know for sure what kicks off a storm in the first place, although they have some theories. One idea is that the differences in ground temperature can create these dust storms. For example, suppose that a big storm occurs in one year. As the storm dies down, lots of dust falls out of the atmosphere onto the surface. This brightens the ground so it reflects more sunlight (higher albedo) and doesn't become as hot. Thus it doesn't generate as much wind. Eventually, however, local winds blow dust away, which leaves some areas with dark surfaces. Sunlight heats these places as the radiation absorbs the heat causing convection currents to grow at the surface, winds pick up, and then a big storm can arise. On Mars, the warmest place is the southern hemisphere in the summer. This is because Mars travels in a very elliptical orbit and it comes closest to the Sun at the time of southern summer. When Mars is closest to the Sun, radiation is 45% stronger than when Mars is farthest from the Sun. (For Earth, however, this difference is only 7% due to Earth's more circular orbit and the extremely large hydrosphere (water) that stabilizes global temperatures. Instead, the tilt of Earth's axis controls terrestrial seasons.) 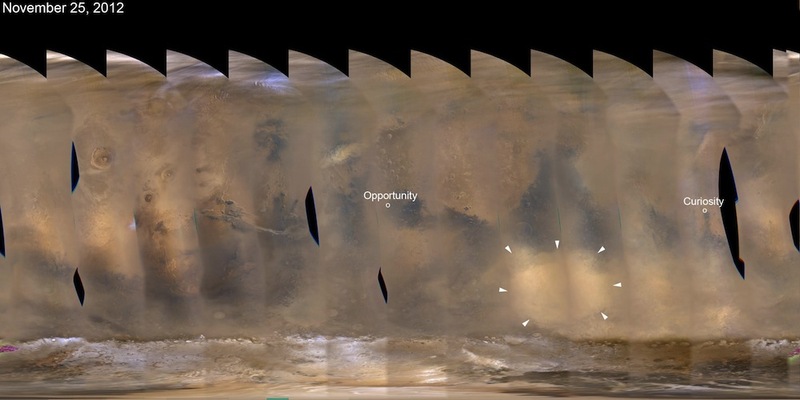 This means that on Mars the heating is greatest and winds blow strongest in southern summer, and that's often when the big global dust storms occur. For all its dust, scientists still wonder why Mars isn't more dusty than it is. Given all the time in which sand and dust have been blowing around freely, why isn't Mars a billiard-ball-smooth planet buried under hundreds of meters of dust? 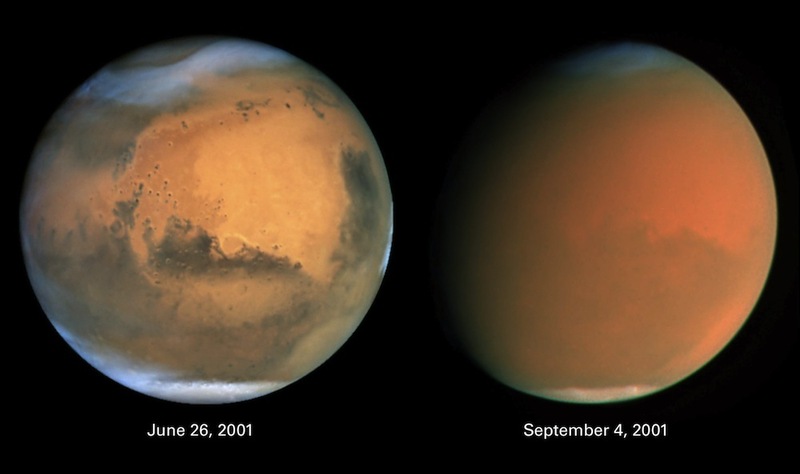 One possible answer: Maybe throughout most of its history, Mars has had too thin an atmosphere for wind to make dust. No dust devils, no storms At times such as now, however, there's enough atmosphere that dust erosion and activity can operate. But over the span of geologic time, the Martian atmosphere stays mostly in a state where nothing much happens to make more dust.